1855 1d Pink envelope addressed to Pulborough near Petworth showing a fine WICKFORD (under Ingatestone), Essex, undated circle in Blue. 1847 1d Pink envelope addressed to Farringdon showing a fine HORKESLEY (under Colchester) undated circle. 1843 Entire to COCKERMOUTH, Cumberland showing a very fine oval framed "Paid/at/CHELMSFORD" in red. 1844 Entire to London showing a very fine oval-framed UNIFORM HANDSTRUCK 'PAID/1d./CHELMSFORD' in red. 1818 Local cover to Rochford showing on the front a very fine ROCHFORD/PENNY POST in GREEN - only known in Green for 1818, EX 360. 1832 Entire to London showing a very fine boxed COLCHESTER/PY POST in Orange, EX 135. 1879 2½d Rosy Mauve, SG 141, Plate 14, tied to mourning envelope to France by an ILFORD/F07 duplex. 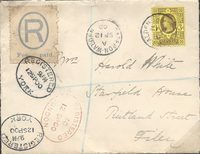 1828 Entire to Braintree with, on the reverse, a fine boxed HALSTEAD/PY POST, EX 202. 1838 Cover to Cambridge showing a fine ROCHFORD/PENNY POST and Boxed 'No 4' receiving office, EX 400. 1932 Card from Esbjerg to Manchester via Harwich showing a very fine HARWICH/SHIP LETTER, Robs S6. Ex Robertson Collection. 1900 3d Purple/Yellow, SG 203, tied to Registered Envelope to Filey by a very fine SAFFRON WALDEN CDS; also showing both London and York oval registered datestamps.